At Tuckahoe High School, it is not unusual to see athletes from every team getting involved in the community. Our athletes know how important it is to work as a team to accomplish a goal and that working together and encouraging each other at practices and games can really have its advantages. Athletes from the soccer teams to the football team to the cheerleading squad, and every team in between, are taking that idea of working together to make a difference into the community and putting it in motion One favorite activity among our athletes is an after school program called Athletes Reading to Cubs. Every week, athletes from the high school volunteer to visit classrooms at our elementary school to read books to the young children. These elementary students love having the athletes read to them! It also provides them with the opportunity to interact with the High School students and ask them what it is like to be an athlete in Tuckahoe High School. 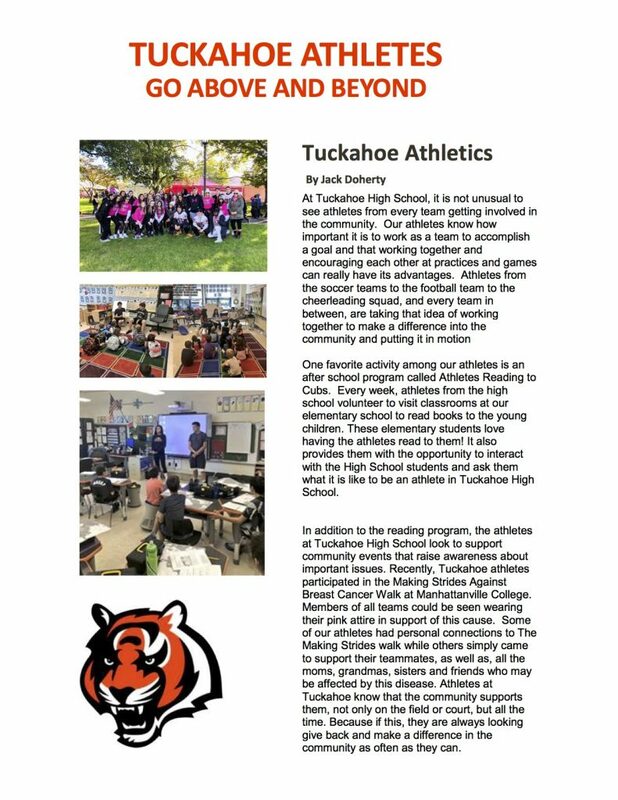 In addition to the reading program, the athletes at Tuckahoe High School look to support community events that raise awareness about important issues. Recently, Tuckahoe athletes participated in the Making Strides Against Breast Cancer Walk at Manhattanville College. Members of all teams could be seen wearing their pink attire in support of this cause. Some of our athletes had personal connections to The Making Strides walk while others simply came to support their teammates, as well as, all the moms, grandmas, sisters and friends who may be affected by this disease. Athletes at Tuckahoe know that the community supports them, not only on the field or court, but all the time. Because if this, they are always looking give back and make a difference in the community as often as they can.